We're (hopefully) moving to Chinatown within the next few of months, so I'm doing my best to reduce the number of cans and jars that we have to schlep with us. Therefore, today's dish was created with our Soy Sauce in mind. Because of this, it definitely has an Asian kick to it. That, and it gave me a wonderful excuse to use my wok. I based this stir-fry on one I made over two years ago, Uncle Wiggly's Stir-fried Turkey and Scallions. Unfortunately, I had no Turkey Thighs, but I had some frozen Chicken Breasts from Trader Joe's, so I defrosted four of them (two for each of us--we're big eaters) and used those instead. Because I was using Breasts rather than the tastier Thighs, I cooked used Chicken Stock as my liquid rather than Broth; I find Stock thicker and, therefore, more flavorful. I served this over Rice, which I highly recommend. Brown Rice adds a wonderfully nutty taste and texture to the dish and, I believe, improves it greatly. Just make sure you make the rice first and just keep it warm while you stir-fry your ingredients; better that the Rice begin to cool than the stir-fry. Also feel free to substitute any other vegetables for the Green Onions. Enjoy! In a small bowl, combine Chicken, 1 1/2 teaspoons Soy Sauce, Sherry, 1/4 teaspoon Brown Sugar, Lemon Pepper, Salt, Pepper and Potato Starch. Mix well with your hands until Chicken feels slightly sticky and evenly marinated. In a separate bowl, mash Soybeans, then add Garlic, Ginger and remaining Soy Sauce and Brown Sugar, mixing well. Heat wok over high heat until smoking. 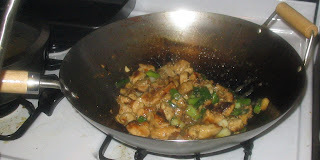 Swirl in Vegetable Oil, coating as much of the sides of the wok as possible. Add Chicken, spreading evenly over the bottom. Let cook 1 minute, undisturbed, until Chicken is browned. Stir-fry, lifting meat with a spatula, for another minute. Add Soybean mixture, 4 Green Onions and Stock and stir-fry for 1 minute, until Chicken is cooked through and sauce is thickened. Add the chopped Green Onion. Serve over Rice. Enjoy!